Bryson DeChambeau matched the fireworks of last year’s US Open and PGA Champion Brooks Koepka by firing a superb 66 to lead the Masters at Augusta after the first round . Picture by GETTY IMAGES. 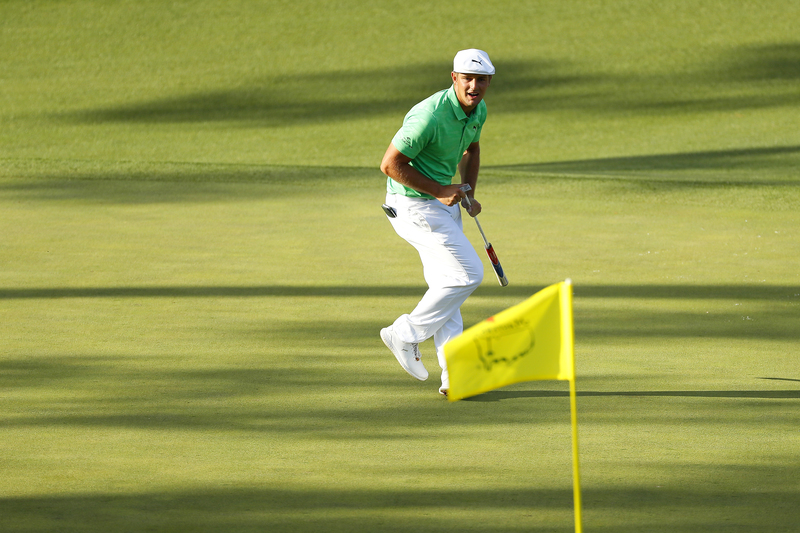 BRYSON DeChambeau produced an incredible finish, posting four closing birdies to share the lead with Brooks Koepka at six-under par the end of day one at the Masters. A remarkable run of scoring in the late groups stretched the field at Augusta National Golf Club, with DeChambeau amongst a host of European Tour players in the mix going into Friday at the first Major Championship of the year. South African debutant Justin Harding was one of the players who had set the target at three-under early in the day. And for a long time it looked like there would be a highly congested leaderboard as a nine-way tie for the lead developed. But four birdies in a row from the 12th hole from Koepka moved the three-time Major champion to six-under and into a two-shot lead. DeChambeau’s incredible finish saw him catch his fellow American, thanks in part to a wonderful second shot on the 18th where he was only denied an eagle by the pin flag. The player, known as “The Mad Scientist” for his quirky mathematical approach to golf, signed for a 66 – his best round at Augusta National. Meanwhile Koepka, playing behind his rival who has won five times since last June, parred his way home to record the only bogey-free round of the day and share top spot. The winner of the Dubai Desert Classic – the same route to the Green Jacket taken by Sergio Garcia in 2017 and Danny Willett in 2016 – said “It’s my best round out here, a 66. “I was just looking to shoot something in the 60s this week because I haven’t done that yet in my couple times playing here. “What a magical back nine. Wind started to pick up, right around Amen Corner, and it was tough. It was not easy one bit.” Bryson added. “But we just stuck to what we knew we should have done, and we did, and was able to execute a beautiful nine-iron on 12 that kind of jump started my back nine, hitting it to five feet, making that putt got me rolling. Three-time Masters winner Phil Mickelson birdied five of his last seven holes to sit one shot off the lead at five-under, a shot clear of fellow American Dustin Johnson and Woburn’s Ian Poulter. The honorary member at Leighton Buzzard Golf Club where he started life in the pro shop, said: “I’m very happy with today’s work. It’s a great start to a long week. “The weather is going to be interesting over the next three days with the thunderstorms coming in,” said Poulter. “The course dried out nicely today. A couple of greens may have been a touch slower than what we’ve previously had in the past on a Thursday. “But I’m happy with that and feel pretty good about it. My whole game was together, from the first hole to the 18th hole. “I mean I only missed two greens in regulation, I think. One of them was nine. I made bogey there. Harding – who has won five times worldwide in the last year, including his maiden European Tour title at the Commercial Bank Qatar Masters – is joined at three-under par by Thailand’s Kiradech Aphibarnrat, Kevin Kisner of the United States, Australian Adam Scott and Spain’s Jon Rahm. South African Harding, who played a practice round with 2011 Green Jacket winner Charl Schwartzel earlier in the week, said: “I was happy with it, I handled my emotions pretty well, a bit annoying on the last making bogey. But at the end of the day I’ll take it. “Golf is purely momentum based. If you take enough confidence into the rounds then you’re bound to play well. “You just pretty much need to get out of your own way. I’ll take it and run if I can – we’re not allowed to run here at Augusta – but I’m pleased. “It’s one of those where I gave myself a couple chances, I didn’t feel like I took great advantage of the par fives. “I managed to hit a wedge close in on 16 but other than that it was one of those where you just kind of sneak in a birdie here or there where you can. Rahm, who finished fourth last year and has since made his debut for Europe in the Ryder Cup thrashing handed out to the Americans in Paris last year, has made a great start to 2019 with five top 10s in eight starts. The Spaniard said: “I think that the most important thing is I never lost patience. “I was one over par on the par fives going to the back nine where it’s easy to get a little frustrated and I didn’t. “I kept my cool and I was able to make a great birdie on nine and get where I’m going. Denmark’s Lucas Bjerregaard, who is also making his debut at Augusta – having reached the last four of the WGC World Match Play in Texas two weeks ago – and The Open champion Francesco Molinari are among a group of 10 players at two-under.